The methods vary from instance to instance, but the message remains the same: "You're not good enough." Young people coming of age in this new millennium face this idea every day, from peers, from authority figures, from the mass media communication swirling around them constantly: "You can't be this, you can't do that, you'll never have the other because you're not good enough." As a girl growing up in the decidedly mixed culture of Brownsville, Texas, Ana Laura thought the same thing…until she realized that, through the power of Christ, with passion, talent, determination and hard work, she could be more than good enough, and she could share that message through the very medium that so often delivers the negative: music. Ana Laura invites listeners to take a glimpse into what the world can look like through the prism of faith and a plethora of musical styles, both modern and classic, on her self-titled Reunion Records debut, Ana Laura. Ana Laura describes herself as a walking contradiction: at one moment self-assured then skittish, quiet then projecting volume, grounded in reality then expressing whimsical ideas. The 19-year-old Texas native is an artistic contradiction as well, merging her love of classical music, traditional orchestral-laced pop and flashes of potent rock into one of the most well-rounded debut records in years. The versatility, energy and maturity that gushes forth from Ana Laura's music comes from a place of wanting to be as artistic as she can possibly be, as sophisticated as she can possibly be, and as well spoken as she can possibly be, born from the hybrid culture she grew up part of in South Texas. "My vision of pop culture is a lot different than I imagine the rest of America's is," Ana Laura says. "Where I grew up, you have the Americanized view and the Mexicanized view. I love America, but I also love my Mexican culture. Pop culture has become slang. I'd like to see it have a little more class, a little more cultured. It's become weird to be good and sweet and nice and proper, and I'd like to see that brought back." The richness of culture and beauty Ana Laura wishes for in everyone's life manifests itself from the very first track of her Reunion debut, a song titled "If You Ever Fall" that opens with lush string arrangements not often heard within the realm of today's pop music, framing Ana Laura's powerful, expressive voice elegantly. The opener gently rolls out one of the album's primary themes, the everyday falling we experience as human beings and the ultimate hope of being lifted into God's comforting embrace. 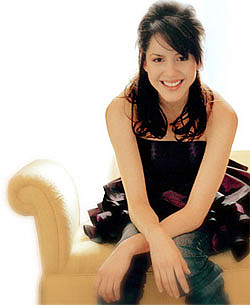 It's one of a number of themes Ana Laura says appear throughout the record, drawn from her experiences growing up and captured through the work of songwriters such as Sam Mizell ( "Who Am I," Point of Grace; "Next Thing You Know" and "The End," Matthew West) and Cindy Morgan ("Breathing In," Salvador; "Dive In," Christy Carlson Romano; "Blessed," Rachael Lampa). Ana Laura played an active role in the songs on her album conversing with songwriters to draw from her own experiences and choosing songs that articulated messages already on her heart. "I went through my share of problems growing up, thinking I wasn't pretty enough or thin enough or smart enough or kind enough. I have a younger sister and I don't want those things to be passed along to her," Ana Laura says. "There are so many girls out there that think they have problems with their bodies or their looks or their personalities, just a lot of different things to think they're not perfect. And even though we can't be perfect, Christ gives us a kind of perfection we can look to, but we have to give it all to Him." The comfort of the opening song gives way to the in-your-face thankfulness presented in "Water," an upbeat, groove-laded track destined to be blared from teenagers' car stereos across the country, much like other up tempo songs such as "Sometimes I Fall" and "No More," which features Ana Laura's first credit as a songwriter. Through the process of developing Ana Laura's 10 tracks, the young Texan found her own horizons changing and shifting, a growth reflected both musically and lyrically. "My tastes have changed a lot. I've been opened up to so many different kinds of music. I don't have to stick to just ballads or up tempo songs, I can do a wide variety of music, which is fun when you're doing a concert and you don't want to be rocking them to death or singing them to sleep," she says. "My classical training plays into it a lot as well. I love classical music, I love opera, but I still like the hard rockin' stuff as well. I like Latin music and its various genres, and I love American music. It was really exciting to bring all of these musical loves into one album." But it's the broader, deeper context of her impending entrance into the world of music that has Ana Laura contemplating her role the most. She embraces the idea of being a role model, not only for young adults her age but also of classic pop music that many generations enjoy. Ana Laura knows the opportunities for leadership that are there, and she relishes that chance. "I don't want to be a shallow leader," she says. "Not only do I want to back my words up with my actions, but I also want to be well versed in them. I definitely think you need to be engaged in the word constantly, and not just the Bible, but also commentaries and other analysis, even children's educational things like Adventures In Odyssey. I love it when Whit teaches me a lesson! "I definitely think it's not just being versed in God, but also knowing what's going on in the world today and how God interacts with that," Ana Laura continues. "We should all know about our country, our culture, our language; it's just a constant growth. I'm never going to know everything about my religion or my country or sports, but I know I need to learn constantly. I don't want to be the kind of leader that just encourages people to wear Prada. I want to be the best I possibly can be at what I do, and I know that I have a responsibility there." Music is her method, the everlasting love of Christ in an ever-changing world is her message, and if her debut album is any indication, Ana Laura's more than good enough to impact the world for a good, long time. Subscribe to Ana Laura RSS Feed to get latest lyrics and news updates. What do you think about Ana Laura? Let us know in the comments below!